Tapping your bl. . .
After years of pandering to the West’s appetite for the exotic and the esoteric, it is gratifying to be at the receiving end. And for once, it is not an umpteenth rehash of Yoga or Vedanta. 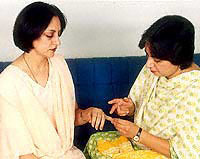 The therapy in question is EFT, short for Emotional Freedom Technique, brought to India from Los Angeles, USA, by one-time cookery columnist Rohini Singh Chopra. Rohini’s excitement is palpable as she offers to demonstrate the therapy on a Life Positive staff member. We hold our collective breath in anticipation. What follows is a series of taps on different parts of the body and it is over. Over? What about the closed eyes and cupped hands that one has come to associate with energy healing? What about the one hour per day routine that one is exhorted to stick to if one expects any results? ‘You know, a recurring impediment to my work with EFT is disbelief,’ she says, an impish grin in place. Probably to keep us from expressing more disbelief, Rohini immediately launches into the whys and wherefores of EFT. It all began when Dr Roger Callahan created TFT (Thought Freedom Technique), the forerunner of EFT. TFT was an improvised form of acupuncture—it made use of light taps instead of needles on meridian points in the body to cure diseases. Not terribly original (the practice of acupressure also entails applying pressure on meridian points), but effective nevertheless. In the short while that it has been around, EFT has gained wide acceptance in the US where support groups are using it to deal with those suffering from a range of psychological conditions ranging from trauma to addiction and phobias. The success with which EFT has been used in treating the trauma of Vietnam War veterans has inspired Rohini to use the therapy among army personnel in India. Rohini’s healing sessions are punctuated with periodic assessments of the intensity of the problem or pain being felt by the patient. Assuming the pre-therapy intensity to be a 10, the subsequent assessments are rated accordingly. Rohini claims a progressive decline in the rating with each dose of EFT’s Basic Recipe. ‘Different aspects of the problem surface each time I give EFT to a patient. For instance, one of my patients came to me complaining of depression as a result of her impending divorce. As I began working with her, I discovered that she was also suffering from guilt towards her children. At one point during the therapy, she suddenly realized that she had been imposing unrealistic demands on herself. EFT helped her to cope with one negative energy block at a time,’ recounts Rohini. For the time being, Rohini has her plate full, what with EFT workshops slated for this month and plans to establish the India chapter of Gerry Jampolski’s Centre for Attitudinal Healing, apart from her regular healing work with reiki. The interview over, Rohini graciously offers to relieve any problems one might have, emotional or otherwise. ‘And keep smiling!’ she adds as she takes our leave, her amiable face wreathed in smiles.